Tonight I really can't think of anything to write - I have had a pretty draining day. So I just thought I would show off my two beautiful grand children. They don't get to spend any time together as they live in separate states, but it is good to see they are having fun. 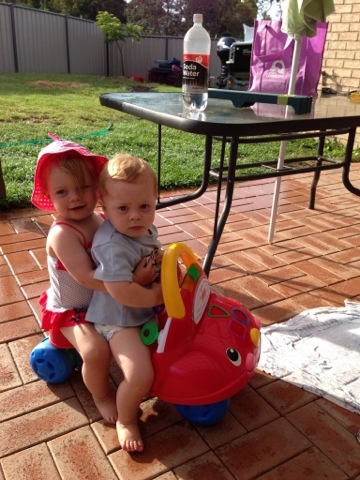 On the front of the bike is O'Shea who is 17 months and behind is Clare who is now 19 months. I am so grateful for the wonderful family I have. Wow look at how fast your adorable babies are growing, they're both so cute and precious! Wishing you a wonderful, fun filled and adventurous year Davine! Thanks Darlene. May your year also be filled with everything you wish for. Life is pretty good isn't it?